My level 1 and 2 HS art class is working on drawing observation skills. This is a fun, but challenging assignment! 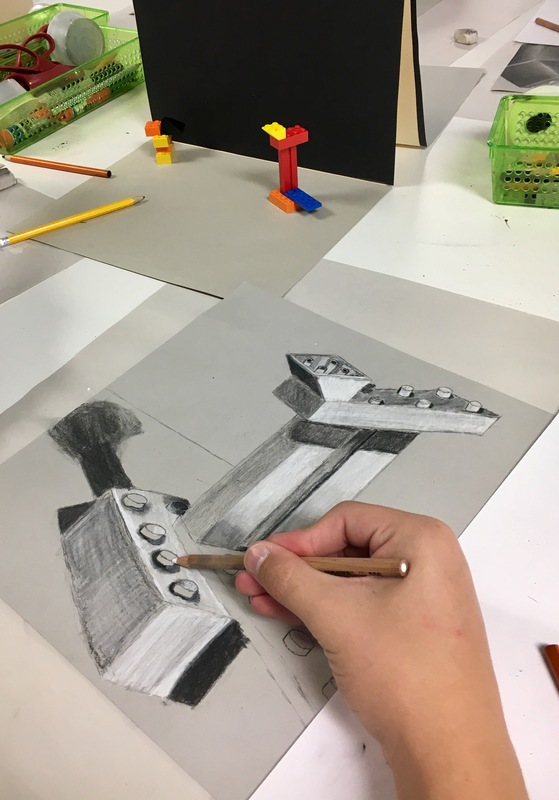 They had to create a 5-6 block Lego sculpture with uneven edges. They drew in pencil first and then rendered with full shading with black & white charcoal pencils on toned paper. Students will learn to draw straight lines swinging from the elbow or shoulder. 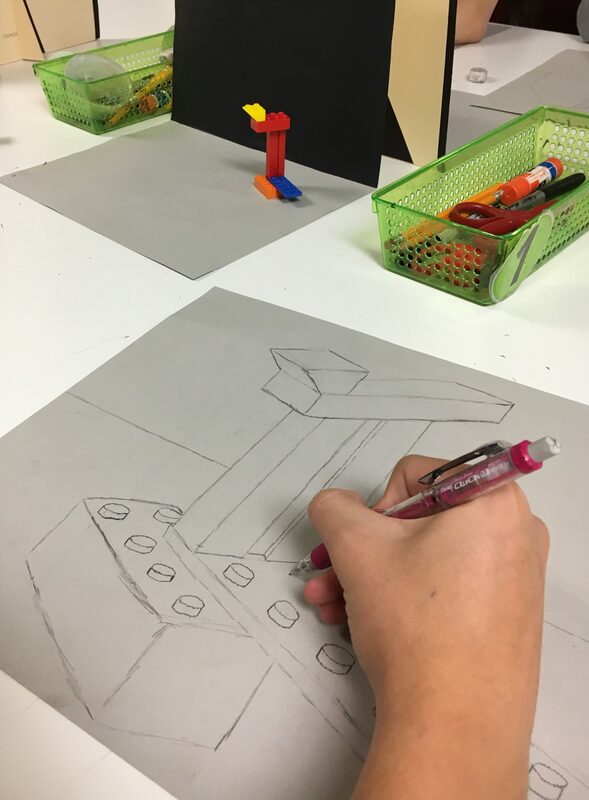 The will learn the observational drawing techniques of “Angles of Lines” and “Degrees of Curvature” and apply them to a drawing. Learn how to judge angles of objects and the slants of the contour edges by using the sighting techniques. “Draw Light Until It’s Right”– remember this motto, it is better to draw lightly first, get the drawing right, then go darker with your lines. a. Contour: an edge of a shape or form as you perceive it. 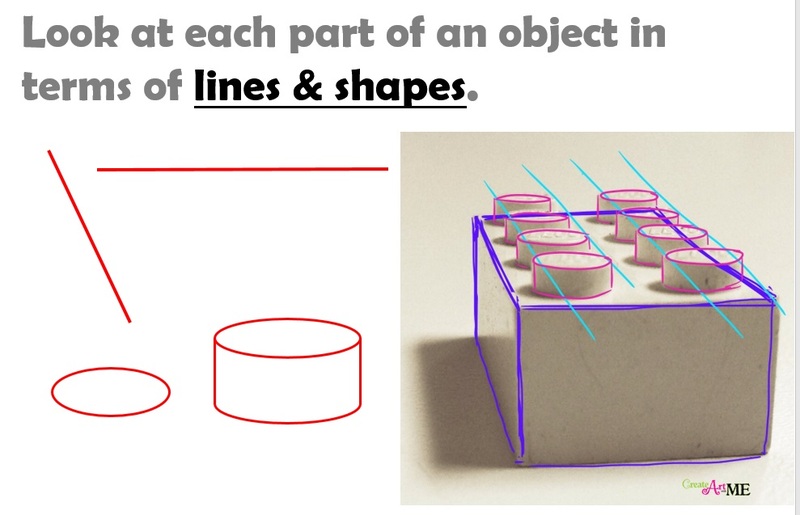 Look at objects in terms of simple lines and shapes. Angled straight lines, curved lines, ellipses, and cylinders for this drawing. Angles of Lines: Observing the line direction and angles of straight lines. Notice how the angles of the lines change based on the point of view. Judge angles of objects and the slants of the contour edges. Degrees of Curvature: observing how much a line curves. 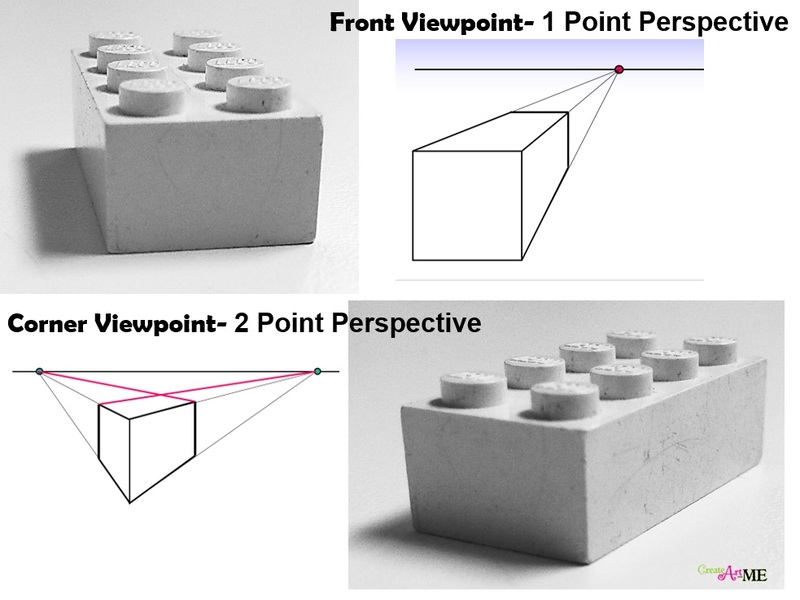 Observe how the curvature of a line changes with your point of view of an object. 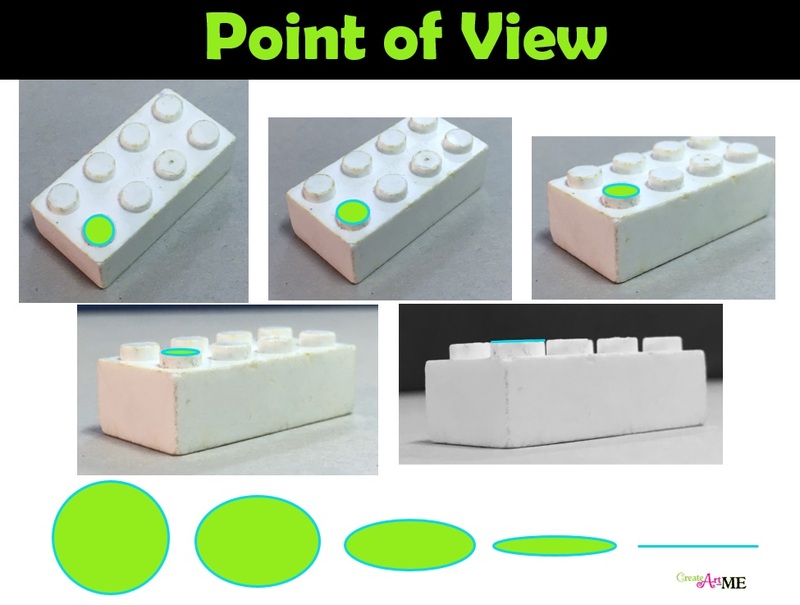 Notice how the cylinders on the Lego change as the point of view changes. 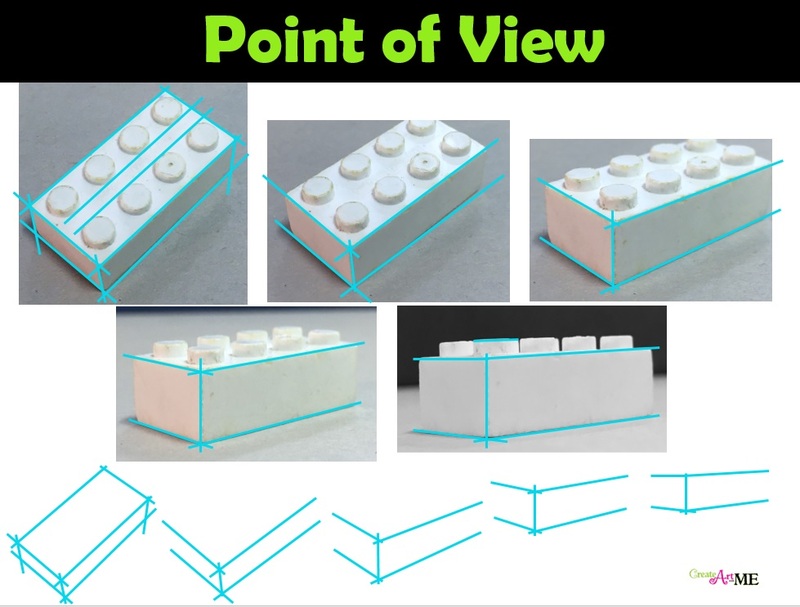 Judging Proportions: Pay close attention to the size (height, width, depth) of the different size Legos. 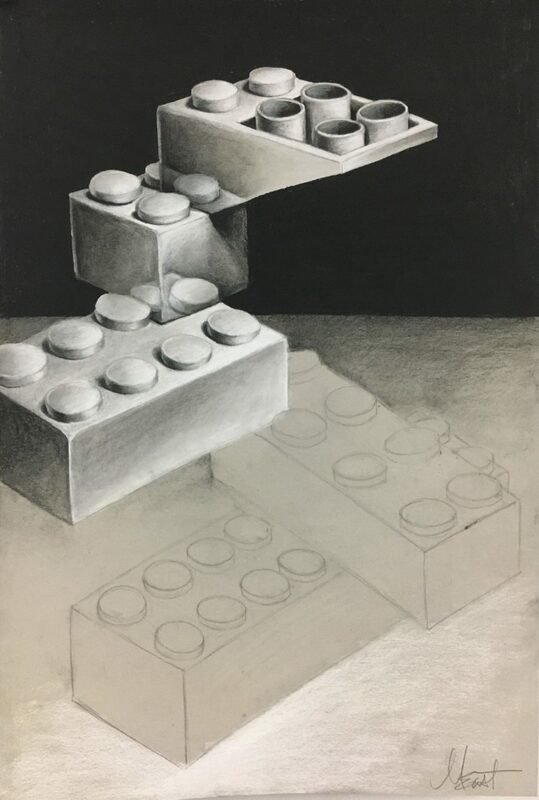 The height of the Legos will most likely be consistent, but will vary in width and depth depending on how many cylinders it has and if it is a single or double wide brick. Notice that ALL the cylinders will be the same width, but will vary in height and depth depending on your view point. 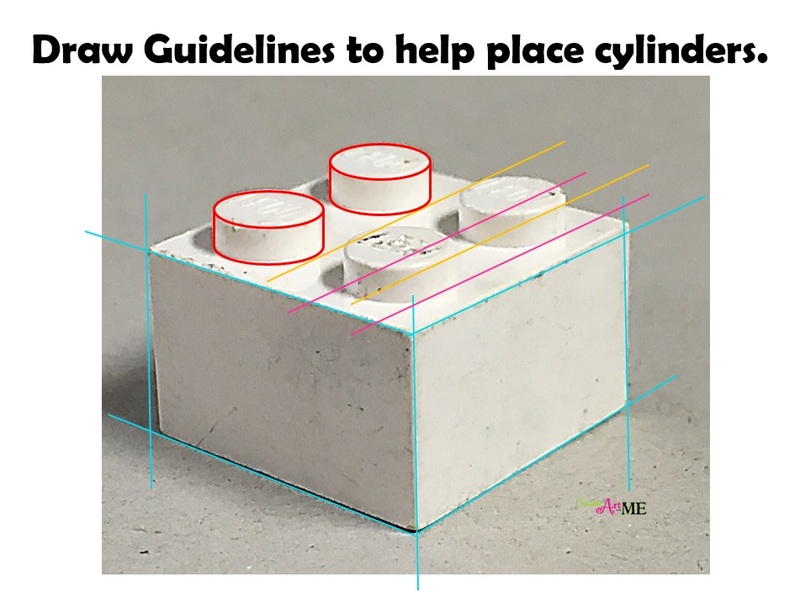 Draw guidelines to help you place the cylinders correctly. 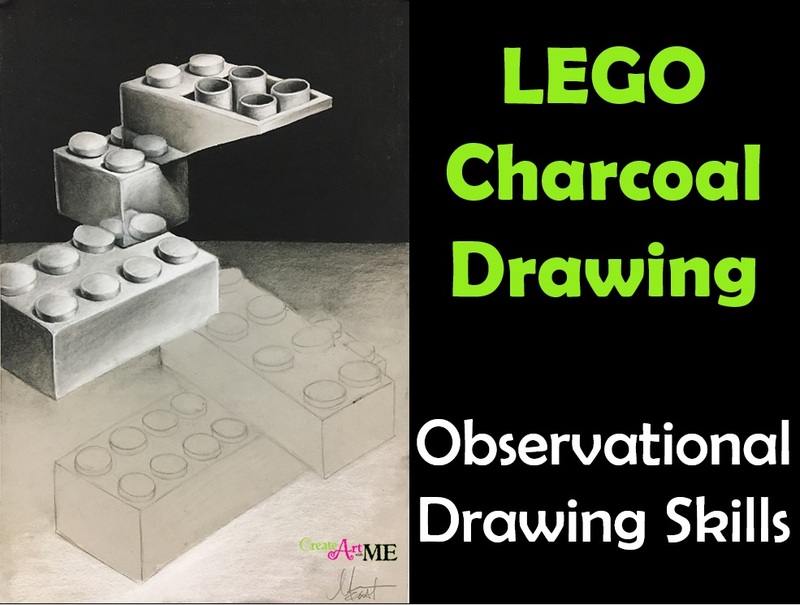 In your sketchbook, draw 4 contour line drawings of various size and shape Legos. Draw 2 from a front viewpoint and 2 from a corner view point. 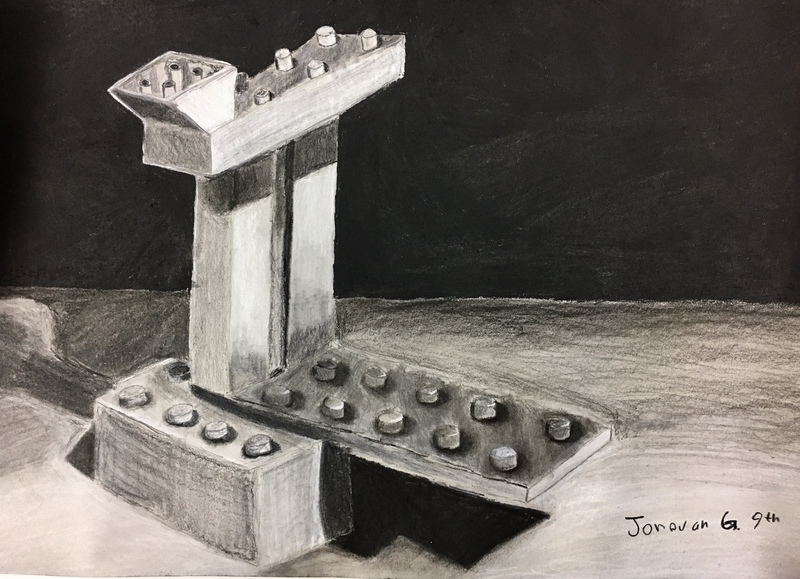 Project Objective: Create an interesting sculpture using unevenly stacked Legos, accurately draw the composition on the paper, and render with a full range of values. 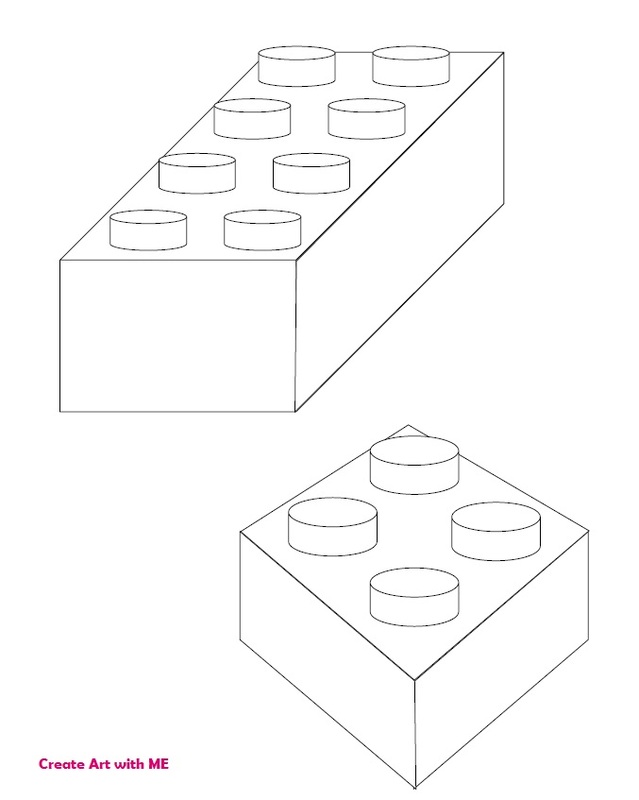 Choose 6-7 Legos of varying sizes and shapes (try to include one with a slanted body). 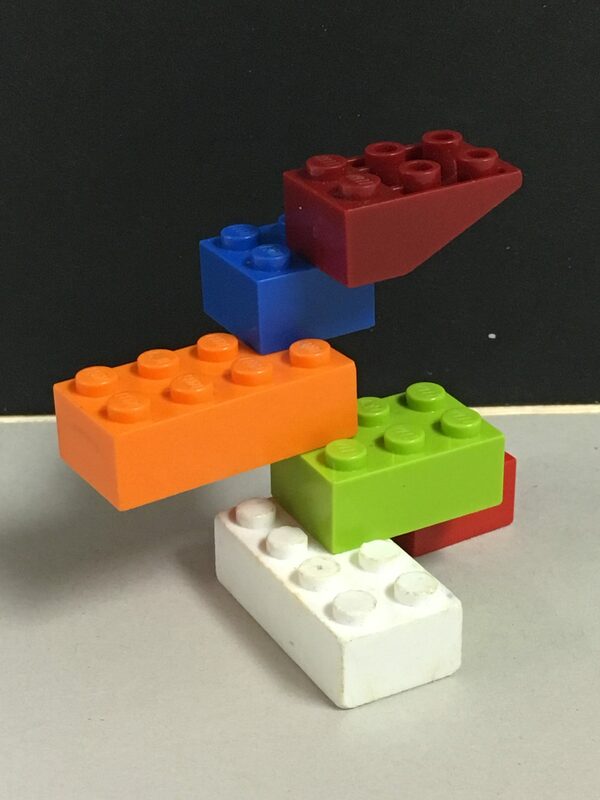 Arrange the Legos UNEVENLY or staggered so that the composition is decisively horizontal or vertical. You may need to change out a Lego or two to help with this. On the toned paper draw your composition as accurately as possible so that it all fits on the page with a pleasing amount of negative space. Render the drawing with white and black charcoal pencils. Use a FULL range of values (blacks to whites). If needed you may exaggerate some of the values to achieve the full range. Erase all fingerprints from background, when finished spray 4 light coats of hairspray to “fix” the charcoal to the paper.